Vol. 6, No 2, CHALEE Gedgaew et al. Hybrid tomato seed production after rice is a way of intensifying agriculture in rainfed areas in Northeast Thailand. Although this type of intensive high-value contract farming has been developing for the last 30 years, there has been little research on it. This study describes the historical development of this system and identifies factors influencing increases and decreases in the number of production sites and farmers producing hybrid tomato seeds. Although production of hybrid tomato seeds was initially adopted by a large number of farmers in many villages in both rainfed and irrigated areas, in recent years it has been carried out only in a smaller number of villages, mostly in rainfed areas. The decision of growers to continue or discontinue production is influenced by both the benefit they gain from production and their relations with the seed companies. The local availability of highly skilled hired workers also affects the concentration of production in certain sites. The development of hybrid tomato seed production among small farmers in Northeast Thailand illustrates a key aspect of the agrarian transformation of the region in the form of increasing intensification and specialization. Over the last 30 years, Northeast Thailand has emerged as one of the most important locations in the world for hybrid tomato seed production under contracts between individual farmers and local or transnational seed companies. In 1995 US-based Asgrow, the world’s largest seed company, obtained 90 of its hybrid tomato seed for global sales from Thailand. The majority of this was produced in Northeast Thailand, mostly by small farmers (Rosset et al. 1999). Veerapong Saenjan (1998) reported that hybrid tomato seed production in Northeast Thailand showed signs of instability due to the uncontrollable cost of production and increasing labor costs. However, despite having some cost control problems, seed companies continued to produce newer and more popular varieties of hybrid tomato seed in the Northeast while shifting production of old varieties and easier-to-produce seeds, such as melons and other cucurbits, to China and Vietnam, where the cost of production was lower than in Northeast Thailand (Rosset et al. 1999). Previous research on hybrid tomato seed production in Northeast Thailand focused on financial analysis, the socioeconomic implications, and environmental impacts but paid little attention to inter- as well as intra-village variations in sustainability of production. The present study focuses on this aspect of hybrid tomato seed production under contract farming in Northeast Thailand. This study was undertaken with the following objectives: (1) to understand the historical background of hybrid tomato seed production under contract farming at various sites in Northeast Thailand; (2) to identify sites where the numbers of growers are increasing and decreasing, and where seed production has totally disappeared; and (3) to identify the factors influencing the dynamic of hybrid tomato seed production. Contract farming is “a contractual arrangement for a fixed term between a farmer and a firm, agreed verbally or in writing before production begins, which provides resources to the farmer and/or specifies one or more conditions of production, in addition to one or more marketing conditions, for agricultural production on land owned or controlled by the farmer, which is non-transferable and gives the firm, not the farmer, exclusive rights and legal title to the crop” (Prowse 2012). It is a form of vertical integration within agricultural commodity chains that gives the agribusiness firm great control over the production process and final product. Therefore, contract farming is a system or a mode of production that has considerable potential for governing the linkage between farmers and agribusiness firms, as a supply chain management strategy (Kirsten and Sartorius 2002; Da Silva 2005; Prowse 2012). Contracts between firms and farmers were first recorded as an innovation more than 100 years ago (Prowse 2012). Nowadays, it has expanded and became a mode of production that allows small-scale farmers to be integrated into the global agro-food system (Eaton and Shepherd 2001; Kirsten and Sartorius 2002; Prowse 2012). It offers an important way for smaller producers to farm in a commercial manner and also provides agribusiness firms with the opportunity to guarantee a reliable source of supply, in terms of both quantity and quality (Delforge 2007). In addition, small-scale farmers can also overcome capital constraints, lack of capacity to adopt technological innovations, and lack of ability to meet the required standards from agribusiness firms further down the value chain (Prowse 2012). Compared to other Asian countries, by the early 1990s Thailand probably had the most extensive experience with contract farming for the widest range of crops (Glover and Lim 1992). Contract farming emerged in Thailand more than four decades ago, particularly for growing sugarcane and tobacco. In the 1970s it was practiced in poultry, pineapple, tomato, and vegetable production (Songsak and Aree 2008). Later it expanded to vegetable seed crops, i.e., hybrid tomato seeds. However, contract farming has generally not been well managed due to disagreements between companies and farmers and defaulting on the part of both agribusiness firms and farmers. The faults of the agribusiness firms have been related to timing, low buying prices, and refusal to purchase the produce, while the faults of farmers have been related to lack of reliability, irregularity, substandard produce, and untimely production. Another reason for the decline of contract farming is the uncontrollable cost of production and increasing labor cost in the case of poultry and seed production (Veerapong 1998). Northeast Thailand is a plateau with poor soil conditions, erratic rainfall, and limited irrigation facilities. Reliance on rainfed agricultural production results in low incomes among small farm holders (Viriya 2001). During the 1960s and 1970s, the Thai government constructed irrigation facilities covering limited areas of the region and supported agricultural crop diversification. Under this scheme, high-value food commodities such as frozen and canned fruit and vegetables, vegetable seeds, and poultry, most of which were grown under contract farming, were promoted. Taiwan used to be one of the core areas of hybrid vegetable seed production. In the 1970s, however, the cost of production started increasing, mainly due to higher wages paid by the manufacturing industry. At that time, Taiwanese and transnational seed companies from the United States and Japan started to search for alternative production sites (Rosset et al. 1999; Tay 2002). Northeast Thailand offered excellent prospects because it has cool dry weather for half the year, which lowers the risk of disease and pest problems. Its small farmers show loyalty as contractees and have the manual dexterity needed to do this work. By 1980, because of the high quality and low cost of its hybrid tomato seeds, Northeast Thailand was placed on the world map of seed production. Many transnational companies from the United States, Europe, Japan, and Taiwan rushed into Northeast Thailand to take advantage of the low cost of production and better quality of tomato seeds (Rosset et al. 1999; Lamyai 2002). Beginning in October 2013 and continuing until March 2014, field surveys were conducted in various parts of the Northeast. As the first step in identifying the sites of production, semi-structured interviews were conducted with agricultural officers at the provincial and subdistrict levels in Khon Kaen Province. Next, the purposive snowball sampling technique was used to identify the exact sites and select key informants who had knowledge about the history of hybrid tomato seed production at various sites. The key informants included 11 officers of the District or Provincial Agricultural Extension Offices, 6 staff of seed companies, 6 village headmen, and 77 growers under contract farming at 30 sites in 29 districts in 9 provinces of Northeast Thailand (Fig. 1). Both individual and group semi-structured interviews were used to gather information from the key informants. The topics consisted of physical, biological, and socioeconomic information including topography, natural resources, cropping calendars, history and evolution of hybrid tomato seed production, seed company operations and relationships with farmers, and the present situation. F1 hybrid tomato cultivars are one of the most popular vegetable crops worldwide (Tay 2002). Two parental lines are developed for genetic crossing through pollination in order to create a hybrid cultivar. The production process is complex and relies upon intensive and dexterous manual labor for emasculation and hybridization of individual flowers (Benziger 1996; Rosset et al. 1999; Sudha et al. 2006). Hybrid tomato seed production is closely associated with the global agro-food complex and transnational seed companies that dominate seed production and distribution. Therefore, a high-intensity contractual relationship with small-scale farmers is required by the seed companies in order to control the seed quality and guard the proprietary germplasm (Rosset et al. 1999). Normally, a written or oral contract with individual farmers for the production and supply of seed at a predetermined price is negotiated by the seed companies. In order to attract farmers, the seed companies provide a complete package of support and risk sharing. They provide advanced inputs on credit and loans for hiring labor subject to a given quota of production. The contract farmers (growers) provide their land and skilled labor. The cost of inputs, repayment of loans, and a service charge are deducted from the remuneration paid to the growers by the seed company. The value of the input credits and loans are usually forgiven by the company when the crop fails through no fault of the growers. In addition, as has also been reported by Vincent Benziger (1996), Veerapong (1998), and Niwat Martwanna and Kamol Lertrat (2007), some companies give a small payment to the growers in case of natural disasters in order to encourage them to continue production the following year. Four phases can be recognized in the history of hybrid tomato seed production in Northeast Thailand. The sites of production changed from one phase to another as did the number of growers at each site. A comparison of the situation in the late 1990s and 2013–14 is summarized in Table 1. In 1976 Petoseed Company (of the United States) started hybrid tomato seed production in rainfed areas, first in a village in Ban Phai District, Khon Kaen Province, and later expanding into four or five nearby villages. In 1979 the company expanded its production into rainfed areas in Sumran, Ban Kho, and Sawathee Subdistricts in Mueang District, Khon Kaen Province (Lamyai 2002) by contracting with the company Adams International via a third company from Taiwan (Rosset et al. 1999). Local Thai companies and joint ventures with transnational companies extended the production sites into both rainfed and irrigated areas. In Udon Thani Province the irrigated area was in Kut Chap District and the rainfed area was in Nong Wua So District. 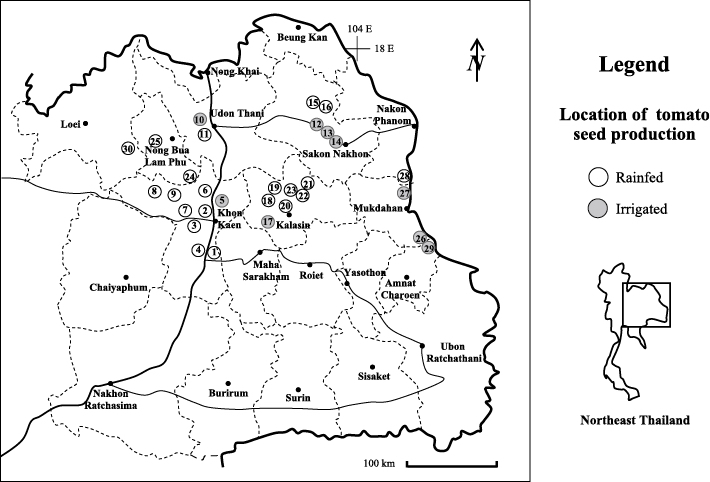 In Sakon Nakhon Province irrigated areas included Phang Khon, Phanna Nikhom, and Mueang Districts (Benziger 1996; Rosset et al. 1999). During this period a large number of new sites were developed in Northeast Thailand due to relocation there by Taiwanese companies (Lamyai 2002). The production sites extended into rainfed areas in Chonnabot, Ban Fang, Nong Ruea, Si Chomphu, and Nam Phong Districts in Khon Kaen Province; Sam Chai District in Kalasin Province; and Non Sang and Na Klang Districts in Nong Bua Lam Phu Province. Production in irrigated areas also extended into Nam Phong District in Khon Kaen Province, Don Tan District in Mukdahan Province, Chanuman District in Amnat Charoen Province, and Yang Talat District in Kalasin Province. During this phase companies tried to expand into new sites in order to compensate for decreased production in the older sites, where the number of growers had declined. The new production sites with new growers were established in rainfed areas, including Wanon Niwat and Akat Amnuai Districts in Sakon Nakhon Province; That Phanom District in Nakhon Phanom Province; Erawan District in Loei Province; Wiang Kao District in Khon Kaen Province; and Kham Muang, Mueang, Huai Phueng, Na Mon, and Somdet Districts in Kalasin Province. In irrigated areas, production extended into Wan Yai District in Mukdahan Province. Thirty sites in nine provinces where hybrid tomato seed used to be or is still being produced were surveyed in the 2013–14 crop year. Of the 30 sites, 21 (70) were in rainfed areas and 9 (30) in irrigated areas (Table 1). Twenty-five sites in five provinces (83.3 of all sites surveyed) are still engaged in production. Nineteen sites are in rainfed areas, and six sites are in irrigated areas under the irrigation schemes of Huai Luang Dam in Udon Thani, Nam Oon Dam in Sakon Nakhon, and Lam Pao Dam in Kalasin Province. There were five sites (16.7 of all surveyed sites) in four provinces where the growers had ceased production. Two of them were in rainfed areas, while three (60) were in irrigated areas served by electrical pumps. The key informants identified five sites where the number of growers had not changed recently. 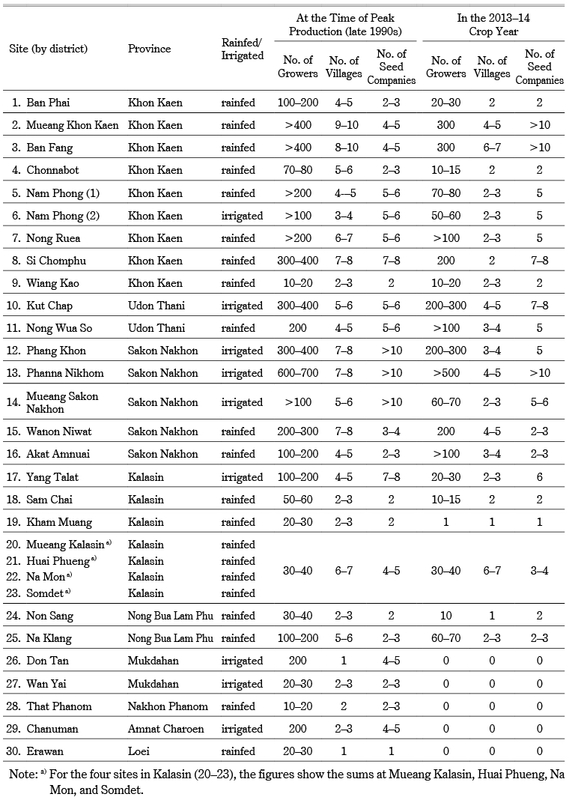 These included Site 9 in Khon Kaen Province and Sites 20–23 in Kalasin Province (Table 1). At all of these sites production had been established rather recently (four to five years ago) because of the decline in the number of growers in other sites. However, each site had fewer than 100 growers and fewer than five seed companies operating. Many growers in 20 sites in five provinces had produced hybrid tomato seeds beginning in the late 1990s, but their number declined recently in all of these sites. The reasons were delicate production methods and management, disease and pest problems, inadequate labor supply, climate variability, deterioration of relations between growers and seed companies, detrimental government policies, and unsatisfactory profits earned by the growers. Presently, production in these 20 sites is confined to growers in only a few villages. These growers can maintain their production for decades. They are in 10 sites with fewer than 100 growers each, 9 sites with 100–500 growers each, and 1 site with more than 500 growers. The number of operating seed companies is fewer than 5 each in 8 sites, 5–10 each in 9 sites, and more than 10 each in 3 sites (Table 1). In the remaining sites in four provinces where all growers had ceased producing hybrid tomato seeds, the growers switched to either pepper seed production (four sites) or sugarcane production to meet the demand of nearby sugar mills (three sites). Ninety-four key informants in 30 sites in nine provinces identified the factors positively or negatively influencing the continuation of hybrid tomato seed production. These factors included: benefits gained by the grower, company-grower relations, tedious work, suitable environment, kind of tomato cultivars, labor supply, grower’s personal characteristics, advanced technology, and government policy (Table 2). The key informants in all sites identified the opportunity to earn a high income as being a very powerful incentive for growers to continue production. This was similarly reported by Benziger (1996), M. Sudha et al. (2006), and M. A. R. Sarkar et al. (2011). Growers in rainfed areas of Northeast Thailand aim to earn a higher income from a smaller land area as compared to other off-season crops. For instance, one grower estimated the median income in an average year from hybrid tomato seeds to be about 100,000 baht (USD3,000) per 0.5–1 rai (800–1,600 m2) of land for four months’ production, whereas sugarcane production uses 10 rai (16,000 m2) for one and a half years to yield the same amount of income. Besides, these growers were satisfied with receiving a lump sum payment that enabled them to invest in other agricultural activities, house construction, children’s higher education, and loan repayment. The same was reported by Sudha et al. (2006). Furthermore, at sites where production had continued for a long time, growers developed specific skills in production and management (e.g., emasculation, pollination, and plot maintenance) that resulted in higher yield and quality. For example, growers in two sites (Sites 2 and 3 in Table 1) who have over 30 years of experience can make contracts with more than two companies that offer higher guaranteed prices or fixed prices. They produce hybrid tomato seeds on more than two plots with different cultivars by using relay or staggered planting that spreads out the labor requirement. This is reported also by Niwat and Kamol (2007). These measures allow the farmers to better control and reduce the risk associated with variations in the seed yield of different tomato cultivars, which greatly increases their opportunity to get a maximum return. Although a high income is a powerful incentive for certain growers, most of the growers who had reduced or ceased production did so because it was not economically worthwhile. They were burdened by the companies’ requirement for high inputs and also faced uncontrollable costs of production, especially increasing labor costs, as reported by Veerapong (1998), Peter Rosset et al. (1999), David Tay (2002), and Niwat and Kamol (2007). Moreover, some failed to have good yields due to very specific production conditions and inadequacies in management and care to meet the requirements of a given cultivar. Consequently, their substandard produce was refused by the companies. In other cases the companies’ guaranteed price was reduced if the amount of product exceeded the quota. The price was predetermined by the company, with which the growers did not have bargaining power, as was also mentioned by Rosset et al. (1999). The key informants at all sites stated that most seed companies provide production inputs on credit to the growers, including seedlings, agro-chemicals, nets to cover the plots, plastic sheets, water pumps, and also cash to pay hired laborers. This system of credit is the same as that reported by Veerapong (1998), Rosset et al. (1999), and Niwat and Kamol (2007). Accompanying the provision of credit is technical advice on crop cultivation and seed production ranging from crop management practices to pollination and seed-processing techniques, as also reported by Benziger (1996), Tay (2002), Sudha et al. (2006), and Niwat and Kamol (2007). Growers are satisfied with the companies’ provision of advanced inputs and guaranteed prices because they do not have to invest their own cash or face market risks. Credits and loans are usually forgiven by the companies in case of crop failure through no fault of the growers, and some companies even give a small remuneration to the growers in order to encourage them to continue planting in future years, as also reported by Benziger (1996), Veerapong (1998), and Niwat and Kamol (2007). Nowadays, payment for the seed produced reaches the growers more quickly than it did in the past. Moreover, some companies provide support for community activities or festivals, as also reported by Niwat and Kamol (2007). Therefore, the current relations between growers and seed companies are very good, which contributes to sustaining the number of growers in various villages. Nevertheless, some growers ceased their production due to discontent with the process of seed testing and delayed payments by seed companies. Similar problems are reported in Karnataka, India (Sudha et al. 2006), and Northeast Thailand (Niwat and Kamol 2007). Hence, some growers at the sites of Phang Khon, Phanna Nikhom, Mueang Sakon Nakhon, and Kut Chap switched to producing other kinds of vegetable seeds, such as bitter gourd, watermelon, and cantaloupe or fresh fruit such as watermelon and cantaloupe. These crops require a shorter cultivation time than tomatoes and yield a quicker income. In addition, after the harvest the growers have time to work as hired laborers in the tomato plots of other growers. In 28 sites, the key informants mentioned that the production process for hybrid tomato seed is complex and requires dedicated management, costly inputs, and intensive and highly skilled labor, and the growers need to perform some very tedious operations, especially emasculation and pollination. There are high risks from disease and insect damage, which makes the heavy application of chemical pesticides mandatory; that, in turn, adversely affects the growers’ health. Therefore, growers in some sites have changed to other crops. For example, the growers at the Don Tan, Chanuman, Si Chomphu, Kut Chap, Phang Khon, and Phanna Nikhom sites switched to producing other kinds of vegetable seed, such as pepper, eggplant, pumpkin, watermelon, and cantaloupe, which are easier to pollinate than tomatoes. Some growers at the Yang Talat and Phang Khon sites (in an irrigated area) changed to growing off-season rice, which requires less labor and agro-chemical use than dose hybrid tomato seed. The growers in rainfed areas such as the Mueang Khon Kaen, Ban Phai, Ban Fang, Nong Ruea, Nong Wua So, Sam Chai, Kham Muang, Non Sang, Na Klang, and Erawan sites switched to growing sugarcane due to its lower labor requirement. The key informants in 26 sites indicated that a suitable environment was one of the reasons for continuous production. Hybrid tomato seed production fits into the cropping calendar as a second crop after rice at the start of the cool, dry season, which can limit disease and pest problems such as wilt disease, root-knot nematodes, and blossom end rot. They have sufficient water for small-scale irrigation, and the sandy loam soils guarantee good water drainage. Tay (2002), who studied hybrid tomato seed production in Taiwan, has a similar view about suitable conditions there. Many key informants strongly believed that the spread of diseases and pests as well as seed yield were directly affected by climate variability. They observed that in the past, when the cool season was cooler, tomato plants flowered later, produced better fruit-set, had fewer diseases and pest problems, and gave a higher seed yield. In recent years, with a warmer cool season, tomato plants flower faster, have low fruit-set, and have more flower abscission; thus, pollination must be done quickly. Tomato plants require moderate temperatures (around 25°C in the day and 15°C at night). Too low a temperature results in a low seed set, and too high a temperature results in more flower abscission, low pollen production, and pest and disease problems (Tay 2002). In the 2012–13 crop year, this had high temperatures in the cool season, whiteflies and viral disease spread quickly, especially in irrigated sites in Sakon Nakhon Province. In the 2013–14 crop year, drought negatively affected hybrid tomato seed yield and seed quality in almost all sites in the rainfed area and caused most of the growers’ incomes to decline. Although the cool, dry winter season in Northeast Thailand is suitable for hybrid tomato seed production because of fewer disease and pest problems (Rosset et al. 1999; Tay 2002), in many sites, for instance at Don Tan, Chanuman, Chonnabot, Ban Fang, Nam Phong, Si Chomphu, Nong Wua So, Kham Muang, Non Sang, and Na Klang, the tomato crop suffers from wilt disease, root-knot nematodes, and blossom end rot, which directly affect seed yield and quality. Companies promoted the grafted tomato seedling technique in order to prevent these problems, but wilt disease is still severe. The irrigated sites in Sakon Nakhon Province, where growers have continually produced the seeds for a long time, now suffer from water contamination and spread of diseases and pests through the irrigation water. Thus, the problem of diseases and pests is an important factor affecting growers’ decision making. The key informants in 21 sites said that tomato cultivars were an important factor influencing the yield. Some cultivars are unsuitable for the site’s ecological conditions, not resistant to disease, have few flowers, easily suffer flower abscission, have small flowers that are difficult to pollinate, and produce poor fruit-set. Every year growers are assigned different cultivars by the seed companies. Such a practice brings about a greater risk when the companies introduce new cultivars, particularly when prior field testing is inadequate. Although the seed companies provide technical and extension services, the growers have to bear the risks (see Niwat and Kamol 2007). In 18 sites, the key informants noted that an adequate supply of skilled laborers, particularly during the pollination period, is an important determinant of continuity. Labor management strategies by the growers include making maximum use of family labor, giving advance cash credit to the hired laborers in their own and nearby villages, and employing their kin as hired exchange laborers (ibid.). Nowadays, all of the production sites are faced with a limited supply of skilled labor. Aged growers no longer have the eyesight for pollination, while younger people prefer to engage in non-farm activities in the industrial and service sectors. A study in Khon Kaen Province found the same problem (ibid.). In addition, workers in Si Chomphu and Kut Chap refuse to do the pollination operation because of the offensive smell of flowers, sticky latex from the anthers, and long working hours (6 a.m.–6 p.m.). They are also afraid of the effects of agro-chemicals on their health. In addition, at the Mueang Khon Kaen, Ban Phai, Ban Fang, Nong Ruea, Nong Wua So, Sam Chai, and Kham Muang sites, the sugarcane harvest competes for labor with tomato pollination. Labor resource competition results in higher wages and hence a higher production cost. These are important factors that affect growers’ decisions on whether to decrease or cease hybrid tomato seed production. The key informants in 14 sites stated that hybrid tomato seed production is complex and tedious and requires dedication; it needs workers with special skills and a willingness to do intensive labor, particularly for special operations such as caring for seedlings, emasculation, pollination, harvesting, and seed cleaning. A team of skillful growers is required, including many dedicated pollinators with good eyesight and manual dexterity. In addition, growers must conform to the seed companies’ designated tasks and strict schedules (Rosset et al. 1999; Tay 2002). Many growers, together with their spouses and children, work in the tomato plots for long hours—sometimes even during the night—to reduce the need for costly hired laborers. Accordingly, our key informants confirmed that growers who were successful in hybrid tomato seed production needed to be diligent, patient, disciplined, and honest, with excellent production and management skills. However, Rosset et al. (1999) report that some growers cannot meet these conditions, which leads them to stop production. Consequently, in the late 1990s, seed companies in Northeast Thailand experienced a general trend of 12 reduction per year in the number of hybrid tomato seed growers. In 14 sites, the key informants believed that the availability of advanced labor-saving technology was one of the factors favoring continuation of hybrid tomato seed production. In the past, the production process was difficult and took a long time to complete. Nowadays, the tasks and the operation time have been reduced by the use of machines, including four-wheel tractors to prepare the land, chemical sprayers, irrigation with mechanical water pumps and drip irrigation systems, and wet seed extractors. Tomato plants’ high tolerance to wilt disease and high seed yield by grafted seedling technology have led to easier plot maintenance. The adoption of nets to cover the plots, plastic sheets to cover the surface of the plots, and some other equipment have made hybrid tomato seed production easier. Moreover, in rainfed areas groundwater can be drawn for irrigation using electrical, diesel, or gas water pumps. In 13 sites, the key informants suggested that some growers ceased production due to government policy. For example, the rice-pledging scheme of the Thai government made it attractive for growers in the irrigated area to change to off-season rice because of the better price and lower labor demand of rice compared to hybrid tomato seed production. Many growers in rainfed areas switched to sugarcane cultivation after the government allowed more private sugar mills to be established near their sites. The policy of increasing the minimum wage to 300 baht per day, including for agricultural labor, had a great effect on the cost of hybrid tomato seed production. Six staff of seed companies identified several favorable factors influencing the continuation of hybrid tomato seed production in Northeast Thailand. These include the grower’s personal characteristics (100), benefits gained by growers (66.7), advanced technology (66.7), suitable environment (66.7), good grower-company relations (50), adequate labor supply (16.7), adequate production processes (16.7), and high capability of company staff (16.7). The last includes selecting a suitable cultivar for the site, providing correct technical advice, and good planning and arrangement of grower farms. In addition, most staff also pointed out that growers were more important than having a suitable environment due to difficulties in recruiting new growers and expanding to new areas of production. Hybrid tomato seed production under contract farming emerged in Northeast Thailand in the late 1970s. It was initiated by transnational seed companies that were searching for cheap and diligent labor, suitable ecological conditions, and high product quality. The numbers of growers rapidly increased in many villages, in both rainfed and irrigated areas, because this crop fits well into the rice-based cropping system, particularly in rainfed areas. More recently, however, the number of growers in many sites has started declining. Consequently, seed companies have either concentrated their operations in a limited number of villages or moved to new areas to open new sites where there may be suitable growers, an adequate skilled labor supply with low wages, and a suitable environment, especially in rainfed areas. Nowadays, growers are confined to only a few villages in many sites. The benefits gained by growers as well as grower-company relations are important factors influencing growers’ decision to continue or discontinue production. Secondary factors include tedious work, suitable environment, kinds of tomato cultivars, labor supply, grower’s personal characteristics, advanced technology, and government policy. For their part, companies point to growers’ personal characteristics, particularly their skill, as important factors influencing continuation of production. Hybrid tomato seed production in Northeast Thailand is sustainable, but the sites for production will continue to shift in certain areas while remaining stable in others. For example, in irrigated areas production declined due to the availability of alternative land uses (e.g., growing off-season rice, watermelon and cantaloupe, vegetables, and seeds of other kinds of vegetables) and contamination of plots by diseases and pests spread through the water in irrigation canals. In rainfed areas in Northeast Thailand production is likely to continue only in certain villages because of limited alternative sources of income and having a suitable environment, including fewer diseases and pests. Possible effects of climate variability were not included in this study but might force companies to introduce new cultivars, which might in turn lead to changes in the distribution of locations for hybrid tomato seed production. Hybrid tomato seed production has evolved as part of the ongoing agrarian transformation of Northeast Thailand. Traditionally, rainfed rice farmers in the Northeast only cultivated a single crop of rice each year, which was mostly used for household consumption. During the dry season the paddy fields were left fallow. In recent years, however, farmers have felt a growing urgency to gain more cash income in order to have a decent living style, invest in agricultural activities, construct houses, take care of their children’s education, and repay loans. Hybrid tomato seed production under contract farming is one way that they can increase their income through agriculture intensification and specialization. This paper is based on the first author’s dissertation research in the Program on System Approaches in Agriculture, Faculty of Agriculture, Khon Kaen University. The research was supported in part by a grant (BRG5680008) from the Thailand Research Fund (TRF) Basic Research Program to Prof. Terry Rambo, but the views expressed in this paper are not necessarily shared by TRF. Benziger, Vincent. 1996. Small Fields, Big Money: Two Successful Programs in Helping Small Farmers Make the Transition to High Value-Added Crops. World Development 24(11): 1681–1693. Da Silva, Carlos Arthur B. 2005. The Growing Role of Contract Farming in Agri-food Systems Development: Drivers, Theory and Practice. Agricultural Management, Marketing and Finance Service. Rome: Food and Agriculture Organization. Delforge, Isabelle. 2007. Contract Farming in Thailand: A View from the Farm. Occasional Papers 2. Focus on the Global South CUSRI, Chulalongkorn University. Eaton, Charles; and Shepherd, Andrew W. 2001. Contract Farming: Partnerships for Growth. Agricultural Services Bulletin 145. Rome: Food and Agriculture Organization. Glover, David; and Lim, Teck Ghee. 1992. Contract Farming in Southeast Asia: Three Country Studies. Kuala Lumpur: Vinlin Press. Kirsten, Johann; and Sartorius, Kurt. 2002. Linking Agribusiness and Small-scale Farmers in Developing Countries: Is There a New Role for Contract Farming? Development Southern Africa 19(4): 503–529. Lamyai Kowithayakorn ลำใย โกวิทยากร. 2002. Kan phalit maletphan phak การผลิตเมล็ดพันธุ์ผัก [Vegetable seed production]. Faculty of Agriculture, Khon Kaen University. Niwat Martwanna นิวัฒน์ มาศวรรณา; and Kamol Lertrat กมล เลิศรัตน์. 2007. Kan tham kan kaset baep mir saunyaa phuk phan: Kan phalit malet phan khong borisat malet phan nai pratheet Thai การทำการเกษตรแบบมีสัญญาผูกพัน: การผลิตเมล็ดพันธุ์ของบริษัทเมล็ดพันธุ์ในประเทศไทย [Contract farming: Seed production of seed companies in Thailand]. Thailand Research Fund report. Prowse, Martin. 2012. Contract Farming in Developing Countries: A Review. Paris: Research Department, Agence Francaise de Developpement. Rosset, Peter; Rice, Robert; and Watts, Michael. 1999. Thailand and the World Tomato: Globalization, New Agricultural Countries (NACs) and the Agrarian Question. International Journal of Sociology Agriculture and Food 8: 71–94. Sarkar, M. A. R.; Rashid, M. H. A.; and Sarker, M. R. 2011. Contract Farming in Tomato Seed Production in Rangpur District of Bangladesh: A Financial Analysis. Progressive Agriculture 22(1–2): 169–179. Songsak Sriboonchitta; and Aree Wiboonpoongse. 2008. Overview of Contract Farming in Thailand: Lessons Learned. Asian Development Bank Institute Discussion Paper No. 112. Sudha, M.; Gajanana, T. M.; and Murthy, D. Sreenivasa. 2006. Economic Impact of Commercial Hybrid Seed Production in Vegetables on Farm Income, Employment and Farm Welfare: A Case of Tomato and Okra in Karnataka. Agricultural Economics Research Review 19 (July–December): 251–268. Tay, David. 2002. Vegetable Hybrid Seed Production. In Proceedings of the International Seed Seminar: Trade Production and Technology, October, pp. 128–139. Consortium for International Seed Technology Training. http://www.seedconsortium.org/PUC/pdf20files/23-Vegetable20Hybrid20Seed20Production.pdf, accessed October 5, 2014. Veerapong Saenjan. 1998. Future Prospect of Small and Medium Size Agribusiness in Thailand. In Proceedings of the Second International Seminar on Agribusiness and Its Impact on Agricultural Production in Southeast Asia (DABIA II), edited by Aran Patanothai and Pirmpoon Keerati-Kasikorn, pp. 159–180. Faculty of Agriculture, Khon Kaen University. Viriya Limpinuntana. 2001. 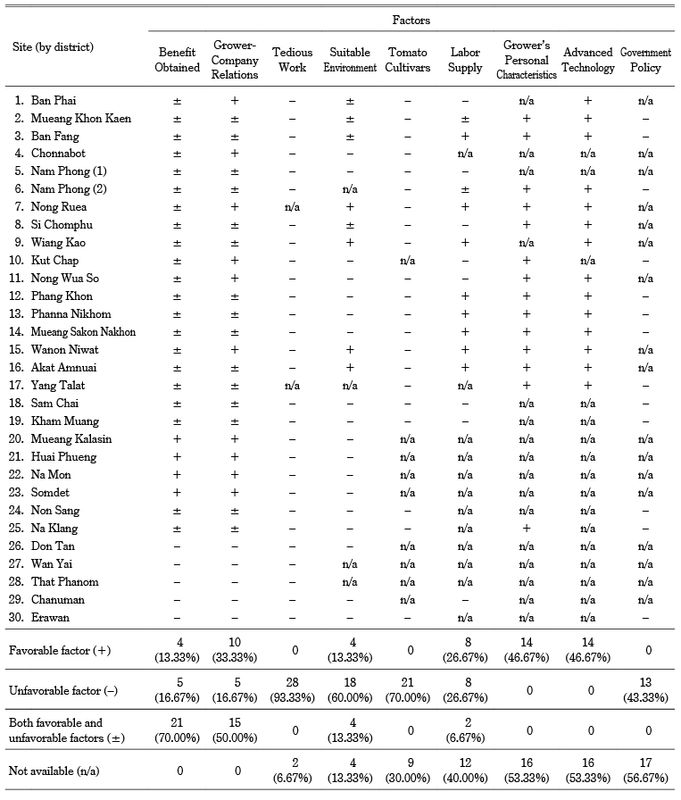 Physical Factors Related to Agricultural Potential and Limitations in Northeast Thailand. In Natural Resource Management Issues in the Korat Basin of Northeast Thailand: An Overview, edited by S. P. Kam, C. T. Hoanh, G. Trebuil, and B. Hardy, pp. 3–17. Metro Manila: International Rice Research Institute (IRRI).